In the year 1132, the King of Munster besieged Dún Bun na Gaillimhe (the fortification at the mouth of Galway ) on Mutton Island and and destroyed the castle. There is a reference in the year 1190 to Lismacuan, ‘The Fort on the Mouth of the Harbour’. In 1641 an order was made that the lands of Mutton Island were to be made use of as commonage for the inhabitants of Galway. The island was strategically important from a military point of view, as in 1651 when Galway was besieged by the English. “The enemie ... caused some Parliament vessels to anchor on Galway’s harbour, and to land some men on Sheepe Island to master the towns from them: with his ordinance very commodious, the number four score and ten choice mariners and other lustie men were then landed, to build half moones, redoubts and other inginier-worke, to mount their artillerie against the towne ... the worke was begun, which if finished, doubtless the towne could not subsiste”. For the people of Galway, “Bryan Roe Oneylle publickly offered himself .... and a partie of 300 men was picked out and marchd with this new commander who thither arriuinge, commanded the whole partie upon pane of death to advance to give an assault upon the newe made works, which no sooner breathed than executed ... This Irish partie had the killing of all the whole crue in the said island then extant, except one onely man, that narrowly excaped by swimming; got all their baggage, tooells and instruments, demolished the works and turned home victorious without the losse of one man”. They won the battle but not the war as the city surrendered on April 12 the following year. In 1691 after the siege of Galway, the castle on Mutton Island was repaired and fortified. A fort was built beside it and provided with 10 pieces of cannon and a company of soldiers, as the English were worried about French privateers coming into the bay. The castle was taken down in 1815 when the lighthouse was built. Our illustration, which first appeared in Hardiman’s History of Galway in 1820, is taken from an original drawing in Galway County Library. The entire cost of the building, which included the keeper’s house, was £4,020 3s 5d. The light on top was first established on October 25 1817, and the first keeper was Walter Walsh. He had to erect notices informing seaweed collectors that they would be prosecuted if they took stones away for ballast, a common practice at the time. The lighthouse served the port of Galway until September 17 1958, when it was automated. Over the years, brighter background lighting along the coast tended to swamp Mutton Island’s light, so it was being suggested that the system should be changed. The final solution was to abolish the light and the Margaretta East buoy and place a new lighted buoy called “Mutton Island” positioned southeast of the island on the north side of the roadstead, and a new lighted buoy called “Tawin Island” on the south side of the roadstead, north west of the shoals. The Harbour Commissioners’ light at the Leveret also plays an important role in approaching Galway Harbour. A leveret is a baby hare, and this light near Hare Island (known locally as “The Candlestick” ) is about 900 yards straight out from the docks, and dates from the 1960s. 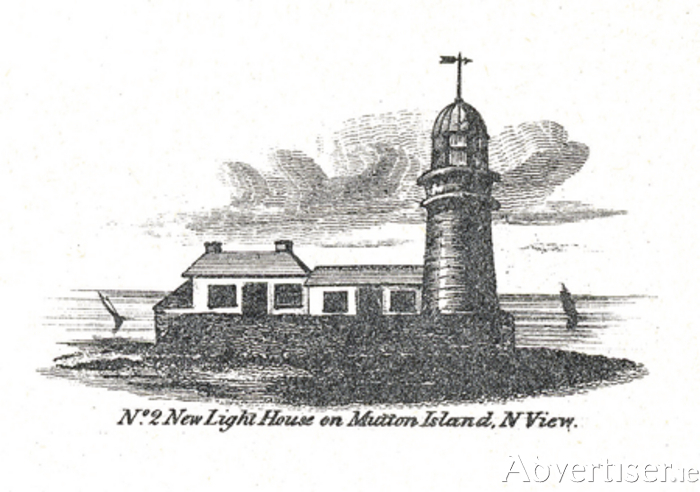 After more than 160 years, Mutton Island’s light was extinguished on December 13 1977. The buildings are still there and are now part of the sewage treatment complex.